Power is essential for the socio-economic development of a country and is being recognized as a basic infrastructural requirement. Although the installed capacity has increased to 210 GW but India faced an energy deficit of 10.1% in 2011-12. Even today, 40 per cent of households are denied electricity; the other 60 per cent do not have reliable access to electricity and is lagging service, measured by hours of supply as well as penetration. Power cuts, erratic voltage and low or high supply frequency have added to the ‘power woes’ of the consumer. Today, the need of the hour is sustainable power supply which will help address the need for increased demand. For a large and dispersed country like India, with its unique geography and current state of economy, innovative means of producing energy needs to be looked at to reduce its dependence on oil and coal as a primary source of energy. Ministry of Power, Government of India launched Rajiv Gandhi Grameen Vidyutikaran Yojana (RGGVY) in 2005 for providing access to electricity to rural households. Electrification of about 1.15 lakh un-electrified villages and electricity connections to 2.34 crore BPL households by 2009 was on the agenda. Under the scheme of Rural Electricity Infrastructure and Household Electrification, DDG was introduced in the XIth Plan to address the issue with the recommendations of Gokak Committee. •	The Internal Combustion Engine. Penetration of DDG: As on 30-11-2012[ ], around 6% of the villages are still to be electrified and these villages will be electrified with a mix of GE and DDG. -Lack of Adequate Information for market development. •	Rural Electrification Policy: The current REP Clearly discusses the means of achieving 100% rural electrification but it falls short of recommending a single nodal Agency for all rural electrification efforts as shown in Fig 1. The Agency will have to act as an overseer for channelizing of funds through various agencies like MNRE, REC etc. and encouraging private participation in the sector. Under Sec 14 of Electricity Act 2003, no licence is required for electricity generation & distribution in notified rural areas (26 states have notified).RE Policy states that for villages/habitations, where grid connectivity would not be feasible or not cost effective, off-grid solutions based on stand-alone systems may be taken up for supply of electricity so that every household gets access to electricity. •	Management of DDG systems: Local authority/panchayat/societies need to maintain the system as they are the real consumers and a sense of belongingness may incorporate in them. •	Selection of Technology: Relevant technology need to be adopted by the authorities with adequate feasibility analysis(in terms of raw materials, feedstock level, transportation facilities, usage pattern of consumers etc.) of particular region. •	Capital Subsidy from Government: Generally Rural cooperative societies manage the high expenditure of the DDG but owning to huge capital expenditure involved in the preliminary stage, government should provide adequate subsidy to the developers or the EPC companies whosoever is involved in the project. The incentives/subsidy should be based on the various factors like geographic location of area, planned capacity addition and output performance. •	Enabling guidelines for Tariff revision: Under the purview of CERC, Tariff setting and revision should be taken care by the concerned nodal agency which has been assigned the successful implementation of DDG in a particular area and moreover there should be crystal clear transparency in this process. •	CDM Benefits: All RE projects are eligible for CDM benefits, DDG projects can be made financially more viable and competitive after encompassing the monetary benefits associated with them. •	Considerations to be taken w.r.t various institutional Models recommended by Gokak Committee: Models like Sunderbans Model, TERI Model, Bangladesh Model may be adopted after suitable changes in order to increase people participation at large. 	Develop transparent and simple interconnection rules and procedures. In the long run, distributed generation will help consumers to get power at lower tariff as power will be available at lower per unit cost. More employment opportunities, both at plant management level and in the manufacturing sector for related machinery, will improve living standards of the people. Availability of power at low cost will attract more investments, which would be more evenly distributed throughout the country rather than being limited to cities alone. Going forward, concerted efforts by the Union and State Governments, financial institutions, academic and research institutes, non-governmental organisations, as well as multilateral and bilateral agencies is required. A distributed generation matrix for India is recommended for lighting the lives of those for whom lighting a bulb still remains a distant dream! •	“Electricity Act 2003”, Ministry of Power, Government of India, New Delhi, India, Jun. 2003. 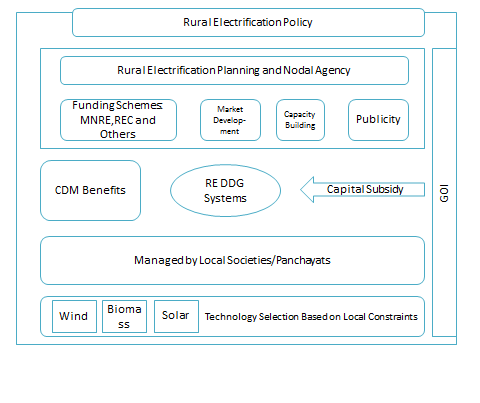 •	World Bank Report on “Empowering Rural India: Expanding Electricity Access by Mobilizing Local Resources” 2010. 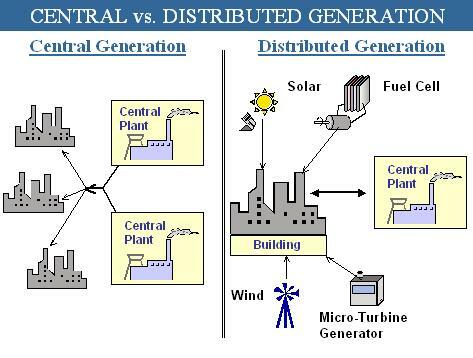 This entry was posted in Other Renewable Sources, Uncategorized and tagged DDG, Decentralised Distributed Generation, Indian Power Sector, MNRE, Policy Recommendations, Power, Regulatory framework, Renewable, RGGVY.